The Virginia State Senate is back in a few days to (continue) debating the budget and Medicaid expansion. A final vote is still not scheduled, but that means it's time to call your Senator and demand they support a clean Medicaid expansion! 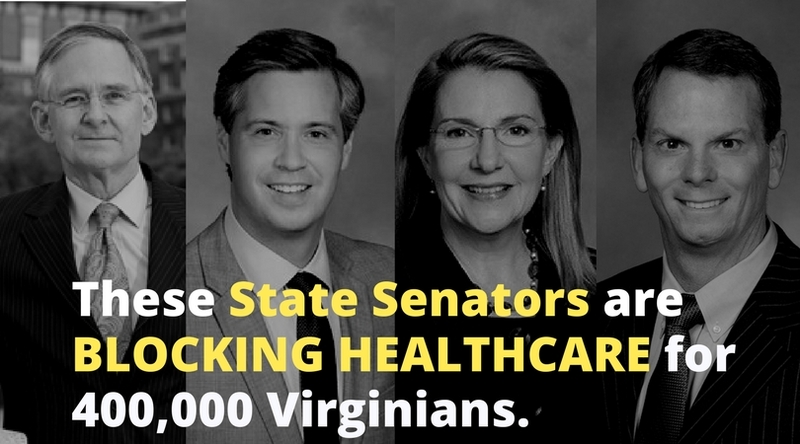 Take 30 seconds right now to call and demand that your Senator stop blocking healthcare for 400,000 Virginians! When the General Assembly is back in session, I expect you to vote YES on a budget that INCLUDES Medicaid expansion. There are 400,000 hard working Virginians who desperately need access to quality affordable healthcare. No one should go bankrupt or have to choose between rent or healthcare when they get sick. No one should have to live in fear that one illness or accident could be catastrophic for their family’s financial security.